This is a simple photo tutorial for a cute little flower that you can use for an adorable embellishment. Its petals curl up and inward, giving it a little dimension. For this photo tutorial, I’m using Caron Simply Soft. I’ve upped the contrast of the photos so that you can see the details better. Start with a Magic Circle; SC 10 in the circle. Join with Slip Stitch into first SC and pull center tight to close the gap. ROUND 1: *Slip Stitch into next SC. In same stitch, ch2, 3DC, 1HDC, ch1. Slip stitch into next SC* around. You will end up with 5 small petals. ROUND 2: *Slip Stitch to first SC of magic circle. SC into Ch space of first petal. 2HDC each of the next 4 stitches. Ch1. Slip Stitch to next SC of magic circle. * Do this 5 times total. Fasten off; weave ends into back of flower. Finish with embellishment, if desired. For my flower’s center, I used a small embellishment brad that I found at my local craft store. You can also find them on Amazon. Just slip it through, bend the bendy things back (yep, I think that’s the technical name) and you have yourself a cute little flower! I used a G (4.25mm) hook with the Caron Simply Soft in the photos, but you can use any yarn and appropriately-sized hook. 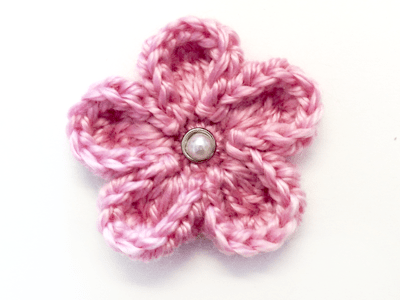 Hi…..I saw a pattern for a spring hat that was white or ivory and trimmed with 1 row of single crochet in purple and it also had a purple and ivory or white layered flower with a purple flower in the middle….I’m pretty sure it was from your website….can you help me find the pattern or tell me where to purchase it please? thank you for this flower pattern. It is perfect for what I had in mind. Wow! What a simple and beautiful flower! Love it. I’m always looking for cute embellishments for project. This little flower fits the bill! Thank you so much. I am new to this. How many chains do I need to do to create the magic circle? Very pretty, I love the pink. Thanks for sharing this pattern. 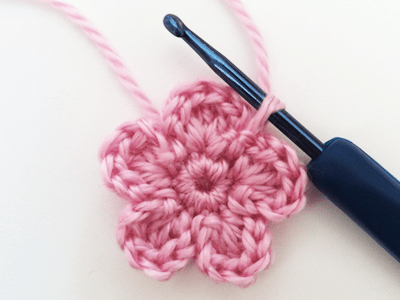 I know of so many things I want to embellish with this cute flower, but first, a coffee cozy! Just whipped up one of these for a hat and it’s too cute! Super easy. Thank you for sharing.